And thanks to everyone for helping to diagnose this! Everyone's patience and willingness to help is appreciated. You should put a note for that in your doc radds.md something like: Testing without thermistor can cause issue. Thanks Dan and DC42, Its was nice to you guys to help me out, many Dev simply dont care if one user out of many have problem. That will have been caused by the firmware trying to send an error message to all interface including the web interface. So should be fixed in Dan's latest release. Got a little hardware question for the radds, Im about to wire the fan on the head , gonna have 2 fan, the hotend and the pla cooling fan, im wondering can I bring only one 12V and share it since the mosfet is a NPN and switch the GND ? 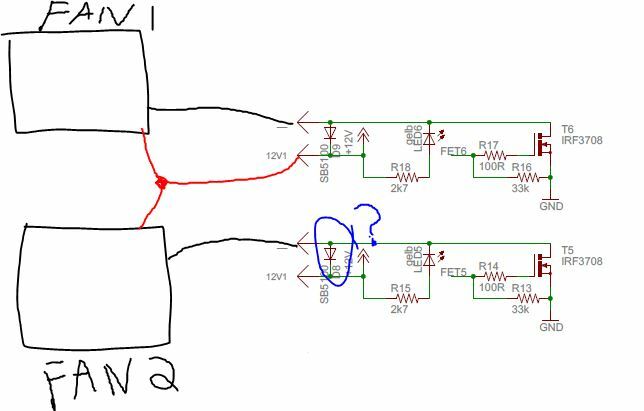 If I do what will happen at the diode of the fan where the 12V is not going through there ? Are the fan really require that diode or its more for the heater ? What's the step rate? That is, what are the steps/mm for that axis? Now, I've been told by some Marlin developers that DRV8825s actually require slightly different step pulse timing but that they mostly work okay until you push the step rate too high. I do not know if that is valid or not; I've pretty much ignored DRV8825s since they are not well suited to 3DP anyway. They are meant for low speed applications such as scanners and ink jet printers. (They have too long of a min. rise time.) As such, I don't myself know if there is indeed a need for slightly different step pulse timing than RRF provides. So im the first one on radds using dvr8825 or what ? Edited 1 time(s). Last edit at 03/04/2016 01:05PM by GroupB. So that's a step rate of 14.7 KHz. So you see any problem having that step rate with reprap firmware ? I myself don't know. dc42 would have an informed opinion on that subject. I don't as regards either DRV8825 or RRF. so there a good chance those rasp 128 or tcsomething wont work too right ? RAP128s work fine for me. However, I stick to resolutions in X & Y below 100 steps/mm. And further, I'm not a Delta user and do not know how much additional load that is imposing. Again, you might ping dc42 for comment. they talk about the firmware is too fast for the dvr8825 and to add stepper high delay 1 or 2 us... do that sound like this can be my problem ? is there such setting in reprapfirmware ? Edited 1 time(s). Last edit at 03/04/2016 02:27PM by GroupB. That's basically what I was referring to earlier as heresay from some Marlin developers: different step pulse timing is needed for DRV8825s. And if that is truly the root problem, then use RAPS-128s or Panucatt SD6128's would be a hardware "fix". I've looked at the code. It effectively creates a 1.07uS step pulse. (More like 1.1 uS if you toss in time to handle the loop and function call, assuming the compiler hasn't unrolled the loop or inlined the function.) I'll see about sending you a build which takes double that. Not quite the 1.8uS but good enough to see if this is indeed the root cause. You may also need to increase the minimum pulse interval, in the case where multiple pulses for a motor are generated in one call to the ISR. We can try 2.0 uS but as dc42 wrote, the delay between successive pulses may also need to be increased. I just checked the datasheet again. The DRV8825 needs 1.9us step pulse high time, 1.9us step pulse low time, 650ns setup time and 650ns hold time for DIR before the rising edge of the step pulse. The corresponding figures for the A4982 are 1us, 1us, 200ns and 200ns. RepRapFirmware will switch to double stepping when the pulse frequency to the motor rises above 14.3kHz. At 160 microsteps/second that equates to a Z movement speed of about 90 mm/sec, or 5400mm/min. So that would explain why the problem occurs at 10000mm/min but not at 5000. Looks like the width of the step pulse isn't causing a problem, but the interval between step pulses is. When you figure this out Dan , send me the file , I will be happy to test it for you... since I cant print because of extruder problem that all I can do "test"
I may have time this evening. Done and e-mailed. The idea here is that the instructions between setting the step pin HIGH and then LOW again will take more than 168 clock cycles (2 uS) and thus no additional action there is needed? Tested 1.09-e, its work I went up to 400 mm/sec (24000 mm/min) without problem, not missing a beat, on my 300 mark all the time. No more reason for dvr8825 user to not give a try to RRF now. Is the dvr8825 the only one with different timing or the raps 128 or tc something too ? will that work or there a faster way to test that ? Edited 1 time(s). Last edit at 03/05/2016 09:34PM by GroupB. Well, you're the only person other than myself with that code hack. Now, we need to decide how to cleanly make this available to others. If people are using other stepper drivers, they won't need that added delay. So, ideally, it should only be when the end user configures it to be used. Possibly even on a per drive basis. dc42 may have an opinion on what gcode to leverage for enabling/disabling it. Yes, that may be needed as well.